French-American octogenarian senior citizen, actress and dancer Leslie Caron was born in Boulogne-Sur-Seine, France on July 1, 1931. This Canada Day baby told MailOnline that she went on a hunger strike at age 5 when "my nanny left and my mother couldn’t be bothered with children so I felt completely abandoned". Caron has subsequently battled anorexia many times throughout her life. With her mother's encouragement (Margaret Caron had been a dancer herself), Leslie Caron began to take ballet lessons at age 11, during World War II. In her autobiography Thank Heaven (2010), Caron recalls seeing German soldiers goose-step down the streets of occupied Paris where her family lived, giving her a life-long aversion to anything resembling military precision, even chorus lines. "My grandfather was born in the nineteen century...(and) like other men in his social class "kept" dancers. The Opera Garnier even has a salon, called "Le Foyer", where young dancers, accompanied by their mothers, met possible "protectors" to discuss and conclude discreet negotiations for the young ladies "future." At age 16 in 1947, Leslie Caron was asked by master ballet dancer Roland Petit to join his new post-war French dance company, Les Ballets des Champs-Élysées. She toured with the company through France, England and Scotland. American dancer-actor Gene Kelly saw her perform and wanted to meet her after the show, but she had left. Leslie continued performing and touring with the troupe, and fell painfully in love with her dance partner, the married ballet dancer Jean Babilée. When Gene Kelly came calling a year or so later in 1950 to offer her a 7-year contract with MGM and a part in a new movie he was going to film, Leslie Caron jumped at the chance to go to Hollywood. She cut her long hair off short and sewed herself a two-piece suit to travel to America in. Once in Hollywood, Caron began taking acting lessons. Leslie Caron's debut movie was in the musical An American in Paris (1951). Caron and Gene Kelly dance a 17-minute dance sequence near the end of An American in Paris. Below, the movie trailer for An American in Paris features Leslie Caron, Gene Kelly, Oscar Levant, and Nina Foch. By the time An American in Paris was released in November 1951, Leslie Caron had married American composer, singer, music producer, and heir to the Hormel family meat-packing business, George (Geordie) Hormel III, in September of that year. After some non-musical movies, Caron once again appeared in the dramatic musical Lili (1953) based on a story by Paul Gallico. Caron was the title character Lili, a poor naive French girl who falls in love with brooding puppeteer Paul, played by actor Mel Ferrer. For her performance in Lili Leslie Caron was nominated for an Academy Award Best Actress, and won the BAFTA Best Actress in a Leading Role. That same year, Lili co-stars Zsa Zsa Gabor and Leslie Caron also appeared in The Story of Three Loves (1953) with Kirk Douglas. Below, Leslie Caron, Mel Ferrer, Jean Pierre Aumont, Zsa Zsa Gabor, and Kurt Kasznar are all featured in the movie trailer for Lili. Meanwhile, according to Leslie Caron, her marriage to George Hormel had been a disappointment - among their other issues as a couple, Hormel was a drug addict. Leslie took a leave from MGM in March 1954 to dance on Broadway with her former employer and mentor Roland Petit's second dance company, Les Ballets de Paris. 1955 was a whirlwind for Leslie Caron. She was divorced from George Hormel and appeared in a play in France. Two of her most popular movies were released: In the musical The Glass Slipper (1955), Leslie Caron is Cinderella, and actor Michael Wilding her Prince. The Glass Slipper featured choreography by Roland Petit, as did her other movie released that year, Daddy Long Legs (1955), in which she co-starred with Fred Astaire, Terry Moore, and Thelma Ritter. Below, a Warner Bros. clip from The Glass Slipper, featuring Leslie Caron. While appearing in the London production of the musical stage play Gigi in 1956, Leslie Caron fell in love the the play's British director, Peter Hall. Leslie Caron and Peter Hall were married in son August 1956. Leslie Caron and Peter Hall's son Christopher Hall was born in March 1957 in London, and daughter Jennifer Hall came the following year, in 1958. Although new husband Peter Hall resented her "going off to do movies" and would have preferred her to stay at home, Caron continued to pursue her acting career. Leslie Caron's co-stars in the movie Gigi (1958), were Maurice Chevalier, Louis Jourdan, and Eva Gabor (Green Acres). Filming began in California in September 1957, and Caron's singing voice was dubbed by Betty Wand. When Gigi was released in May 1958,the movie was a smash box office and critical success. Gigi won 9 Academy Awards and 3 Golden Globe Awards. Leslie Caron, Maurice Chevalier, and Louis Jourdan, were each nominated for Golden Globes for their performances in the movie. Below, Leslie Caron, Maurice Chevalier, Louis Jourdan, and Hermione Gingold are featured in the movie trailer for Gigi. Caron continued to appear in movies throughout the rest of the 1950's and early 1960's, while maintaining her home base in England. Her co-stars during this era included the top echelon of Hollywood - Dirk Bogarde in The Doctor's Dilemma (1958), Henry Fonda in The Man Who Understood Women (1959), George Peppard (Banacek), Roddy McDowall, Arte Johnson and Nanette Fabray in The Subterraneans (1960). 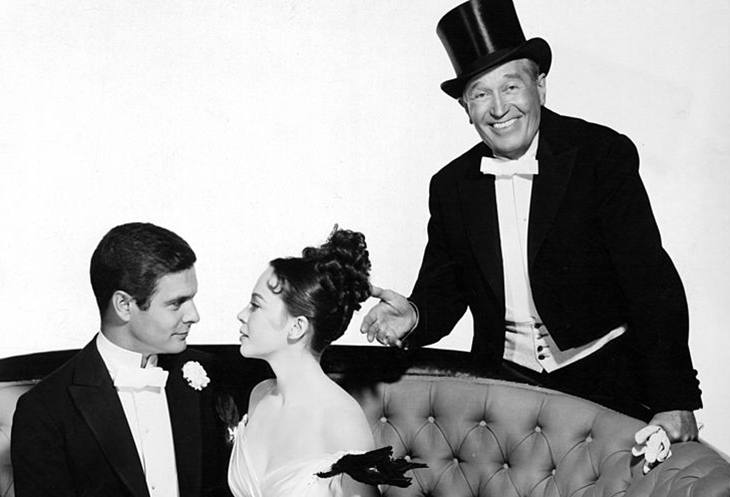 In the romantic drama Fanny (1961), Leslie Caron's leading men again included Maurice Chevalier, this time as an infatuated older man who marries her character when she becomes pregnant. Caron's performance in Fanny garnered her another Golden Globe Best Actress nomination. Below, Leslie Caron, Maurice Chevalier, and Charles Boyer, and her romantic lead Horst Buchholz are all featured in the movie trailer for Fanny. The British drama The L-Shaped Room (1962) again saw Leslie Caron playing an young, unwed pregnant women. For her moving performance in The L-Shaped Room, Caron won both a BAFTA and Golden Globe Best Actress Award, and was nominated for an Academy Award for Best Actress. Released that same year was Guns of Darkness, in which she co-starred with David Niven as a married couple escaping a revolution. 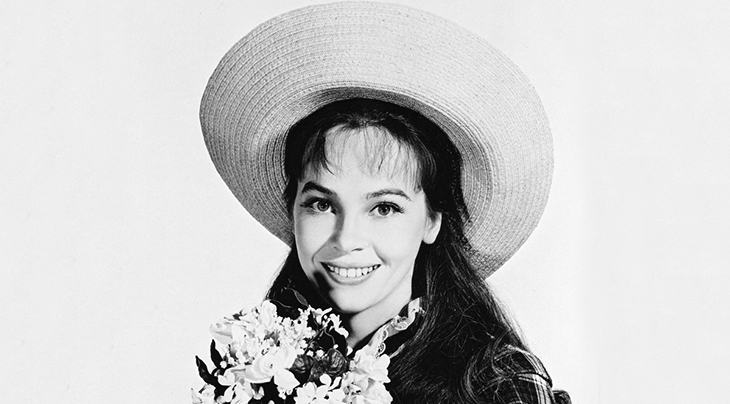 While in Hollywood in 1963 to film Father Goose (1964) with leading man Cary Grant, Leslie Caron met Warren Beatty at a dinner. During her subsequent two-year affair with Warren Beatty, he produced and starred in his blockbuster movie Bonnie and Clyde (1967), and Caron only saw her children during their school holidays. She told MailOnline that "Warren and I were like Brad Pitt and Angelina Jolie. We were the "it" couple". 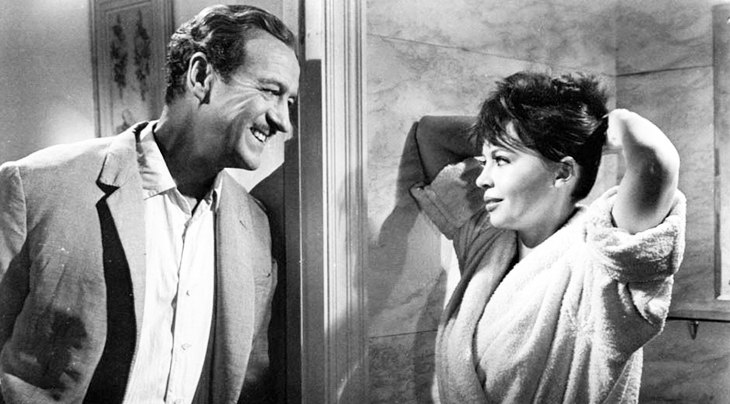 Leslie Caron continued to find movie roles in Hollywood in the late 1960's, such as A Very Special Favor (1965), with Rock Hudson. 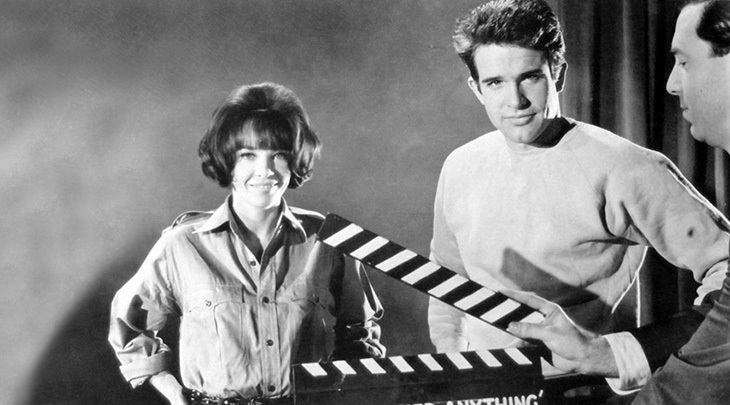 In 1965 Leslie Caron and Warren Beatty went to Surrey, England to film Promise Her Anything (1965). Caron's husband Peter Hall sued Caron for divorce and Warren Beatty was named as a co-respondent. Beatty was ordered to pay the cost of the Caron/Hall divorce when it was granted that year. Their affair over, Warren Beatty moved on to a relationship with actress Julie Christie and Leslie Caron filmed the WWII movie Is Paris Burning? (1966) in France. The huge, mostly French cast of Is Paris Burning? included actors Yves Montand, Jean-Paul Belmondo, Alain Delon, Simone Signoret, and Jean-Louis Trintignant, as well as Americans Glenn Ford, George Chakiris, Robert Stack, and Kirk Douglas. Kirk Douglas and Leslie Caron had been co-stars previously in different segments of the movie The Story of Three Loves (1953). More movies filmed in Europe followed. Leslie Caron met American producer Michael Laughlin while he was living in London and they married in 1969. They moved back to California and lived in Bel Air for several years; for most of that time Caron did not film movies. She did make a few appearances that included the television mini-series QB VII (1974), co-starring with Ben Gazzara, Anthony Hopkins, and Anthony Andrews. Leslie Caron and Michael Laughlin moved to Paris, France and lived there for a year in 1975, but they separated when Laughlin returned to Los Angeles; she stayed in France. Leslie Caron and Michael Laughlin divorced in 1980. Caron found that in her 40's, the acting work became scarce, although she appeared in the Ken Russell dud Valentino (1977) as one of the lovers of fellow ballet dancer Rudolph Nureyev. Leslie Caron was also in the sci-fi movie Goldengirl (1979) co-starring with Susan Anton, Jame Coburn, Robert Culp, Michael Lerner, and Nicolas Coster. In her 50+ years during the 1980's and early 1990's, Leslie Caron battled signs of aging with a few face-lifts. Her big-screen appearances were in mostly "B" movies in smaller roles, filmed in America or overseas. Her daughter Jenny Hall appeared with her in an episode of The Love Boat in 1986, and she had a recurring role for 3 episodes on the night-time soap Falcon Crest in 1987. In June 1993 Leslie Caron became a partner in at a hotel and restaurant south of Paris, France, and began focusing on managing the Auberge La Lucarne aux Chouettes (The Owls' Nest). On the cusp of becoming a senior citizen and worried about money and costly renovations to the inn, she began drinking heavily to combat anxiety. A failed suicide attempt with wine and pills prompted her to begin therapy and attend AA for 10 years. The TV mini-series 1914-1918 (1996) saw Leslie Caron as part of a large ensemble cast of all-stars. Her co-stars in 1914-1918 included Judi Dench, Jürgen Prochnow, Michael York, Ralph Fiennes, David Keith, Martin Landau, Malcolm McDowell, Liam Neeson, Helen Mirren, Marion Ross, and Helena Bonham Carter. Michael York and Leslie Caron were co-stars again that same year in the TV movie The Ring (1996), with Natassja Kinski, Linda Lavin, James Sikking, and Jon Tenny. Leslie Caron's big-screen movie roles since becoming a senior citizen have been limited to small roles in two movies - Chocolat (2000) with Juliette Binoche, Judi Dench, Johnny Depp, Lena Olin and Alfred Molina; and Le Divorce (2003) with Kate Hudson, Glenn Close, Sam Waterston, Stockard Channing, and Bebe Neuwirth. Caron has also appeared in some made-for-television movies such as the TV musical comedy The Last of the Blonde Bombshells (2000) with Ian Holm and Olympia Dukakis, re-uniting again with her 1914-1918 and Chocolat co-star Judi Dench. The TV mystery Murder on the Orient Express (2001) was also a reunion for Leslie Caron and her Chocolat co-star Alfred Molina. That same year she became a septuagenarian senior citizen, and was been in several plays in England, France, and Australia. Leslie Caron won a Primetime Emmy Award for Outstanding Guest Actress in a Drama Series for her performance in an episode of Law & Order: Special Victims Unit, in 2006. Caron received her star on the Hollywood Walk of Fame in 2009, and gave up the inn in France that year. She wrote and published her autobiography Thank Heaven (2010) dedicated to her grown children, actress/artist and PR agency owner Jenny Wilhide and TV producer Christopher, and has said the experience of writing it was "cathartic". 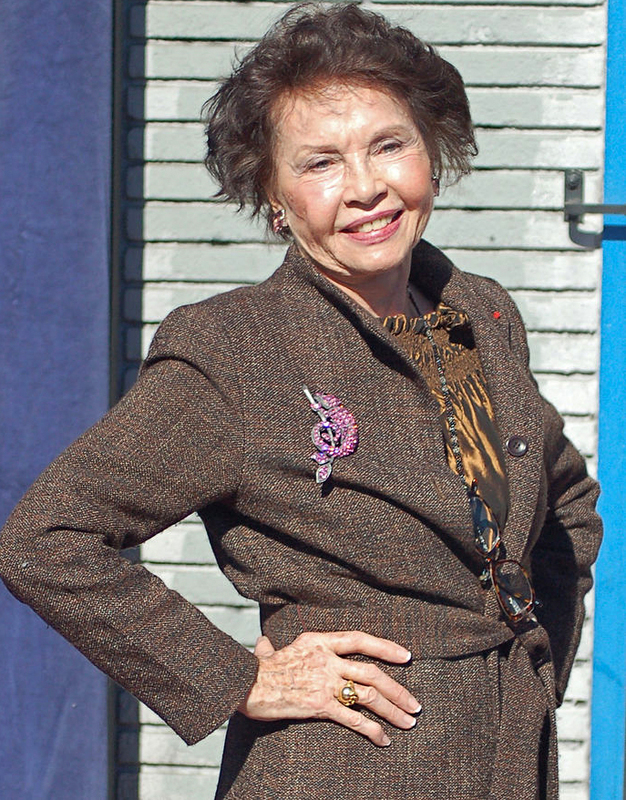 Below, Scott Feinberg interviewed octogenarian Leslie Caron about her life and career in 2013. 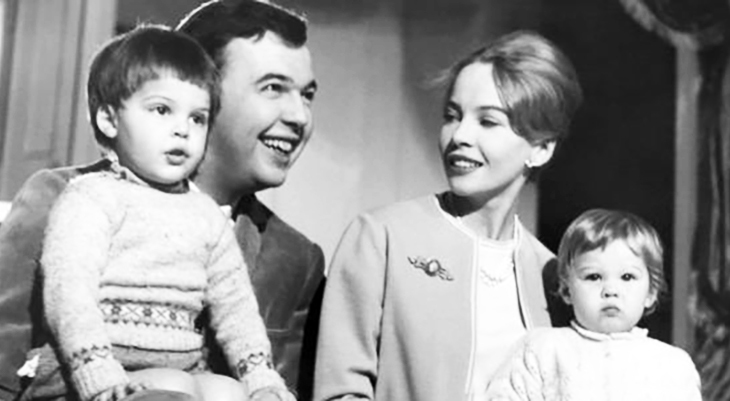 Leslie Caron lives in England so she can be closer to her children and grandchildren, and is still on friendly terms with ex-husband Peter Hall. Most recently she could be seen in the 2014 play Six Dance Lessons in Six Weeks in Laguna Beach, California, and on television as Countess Mavrodaki in the British series The Durrells in Corfu, directed by her son Christopher Hall.